This picture comes to us from an Athens, Ga., resident who was just trying to get some grocery shopping done when he was confronted by this helldog in his local Kroger. 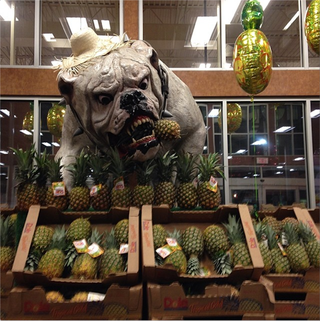 Our tipster surmises that this is supposed to be the Georgia Bulldog, but he is not sure why Uga is wearing a sombrero and devouring pineapples. We don't have any good explanations to offer, either.